In 1690 the governor of Massachusetts William Phips asked the 54-year-old pastor Rev. John Hale of Beverly to accompany the campaign against the French in Quebec as chaplain, and Hale willingly agreed. 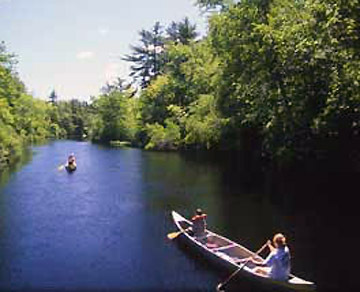 Hale returned home in 1690, but a crisis soon erupted that would test his convictions. It was January 1692 that the witch hysteria began in Salem. Hale was Harvard-educated, but he was no stranger to cases of witches, As a child, Hale had witnessed the execution of Margaret Jones, the first of 15 people to be executed for witchcraft in New England during the years 1648–1663. The new minister Samuel Parris at Salem Village (Danvers) had moved in from Boston and called upon the senior minister, Hale, to evaluate a case of several girls who exhibited symptoms that he feared resembled the work of a witch. 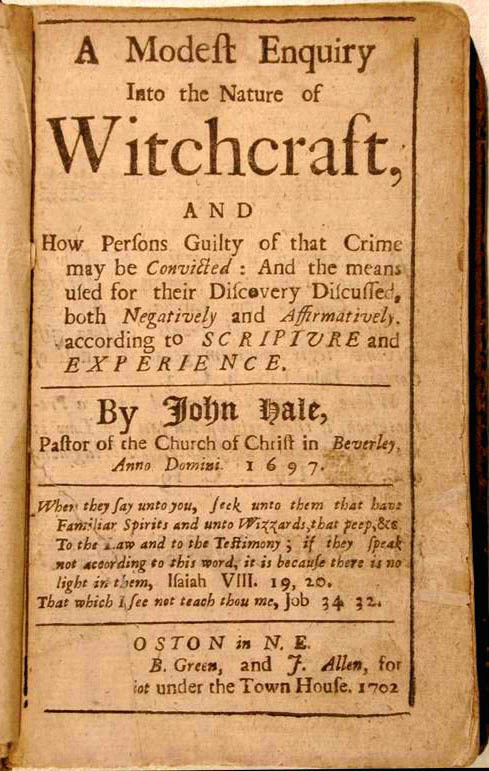 Hale had previously participated in witch trials as an expert, and after looking into the matter Hale concluded, as had Parris, that witchcraft was at work in Salem. In October of that year, however, the Rev. Hale’s own wife was accused of witchcraft. He hid his wife away, and his opinion changed to opposition, joining the protests of ministers in Ipswich and other nearby villages. Hale would later publish an analysis of the trials titled, A Modest Enquiry into the Nature of Witchcraft, in which he wrote,“Such was the darkness of that day, the tortures and lamentations of the afflicted and the power of former precedents that we walked in the clouds and could not see our way.” He asserted that Satan had tricked the Puritans, and thus excused the judges, witnesses and himself from complete blame but made a plea for forgiveness. The Preface TO THE Christian READER. A Modest Enquiry, Into the Nature of WITCHCRAFT.